IDEC has an expanded relay selection with the 6mm RV8H series interface relays featuring UL Listed Class I Division 2 ratings, designed specifically for use in hazardous locations. These interface relays are suited for controls used in applications such as gas and oil equipment, panel building, refineries, painting and mixing chambers, mining, waste water treatment and other locations. 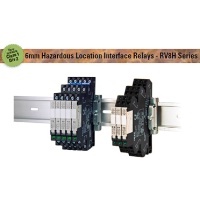 ECD has a large inventory of IDEC RV8H relays in stock and ready to ship. Call ECD for all your IDEC relay needs.